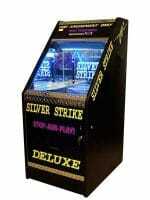 AMUSEMENT GAME MACHINE DISTRIBUTORS! Please contact them directly for more detailed information about their equipment and costs. AMA Distributors sells Billiards, Pool Tables, Video Arcades, Pinball Machines, Jukeboxes, Bar Top Games, Table Games, Bar Stools, Redemption, Slot Machines, Dart Boards, Cues & Cases, Game Kits & Rentals. Amusement Concepts Inc. – We are your experts in the field of Amusement, Video, Redemption, and Merchandiser Games, Jukeboxes and ATMs! Based in St Louis, MO. Betson Enterprises, is the world’s leading coin operated distributor of amusement and vending equipment, service and coin operated parts. With over 75 years of experience and leadership in the coin-operated industry, we will help you make informed decisions that are best for your business. Headquarters is Carlstadt, NJ, click here for list of distribution office locations. Global Billiard Mfg. is a leading manufacturer of upscale and traditional coin operated pool tables. WE MAKE POOL TABLES THAT MAKE MONEY! COIN OPERATED + BILL ACCEPTANCE + MOBILE PAY. SINCE 1968. Visit Website: https://www.globalbilliard.com/. G&T Gaming is your complete Video Lottery and Amusement Gaming provider. We are your one stop shop which includes providing your surveillance and security needs along with providing the highest level of customer service available. Call us today at 605-226-2686.